Brisbane is an excellent city for impressing out-of-town visitors, and South Bank is the family-friendly weekend jewel in its crown. We lucked out by visiting South Bank on the first Sunday of the month — when the Young Designers Markets are held in conjunction with the regular weekend markets. 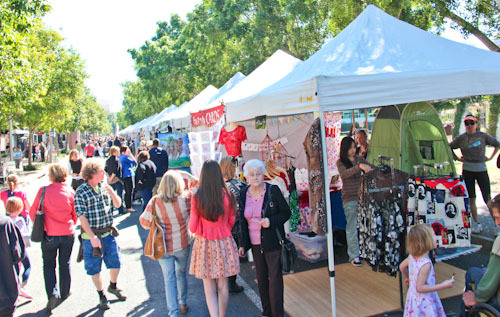 On the first Sunday of the month, the regular weekend market stalls are augmented by a row in Little Stanley Street where emerging artists showcase their designs and handiworks. 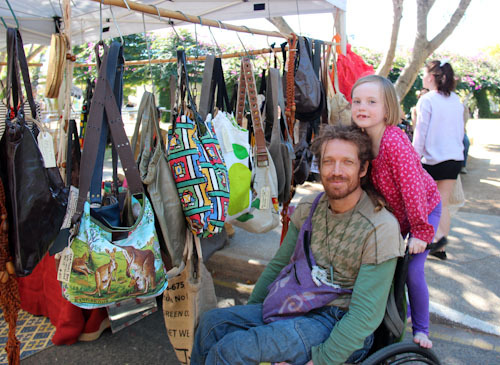 Johnny has a keen interest in design and we enjoy discussing the handicrafts as we browse the stalls. I came away from the markets with the business cards from only two interesting stall-holders. Lindy Longhurst creates beautiful, intricately-detailed pictures of whimsical women, including a fabulous red-haired mermaid with a patchwork fish-tail. I also was attracted to Gordana’s interesting clothing designs under the label Loose Lemur — they have an edgy, steampunk look. I want to browse both ladies’ websites properly later. After we had gone up and down all the market rows, buying only two special necklaces — Aisha’s is a row of tiny birds on a scrabble piece, and Brioni’s is her name written on a grain of rice in a vial of water — we explored a little more of the South Bank Parklands. 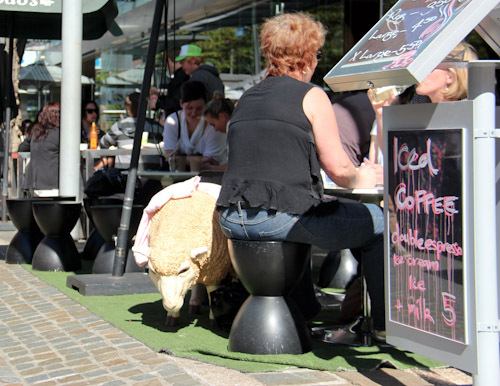 A sheep keeps company with the patrons of this café. I don't know why it stands there, but one customer clearly thought it was the ideal place to put her (wool?) cardigan! 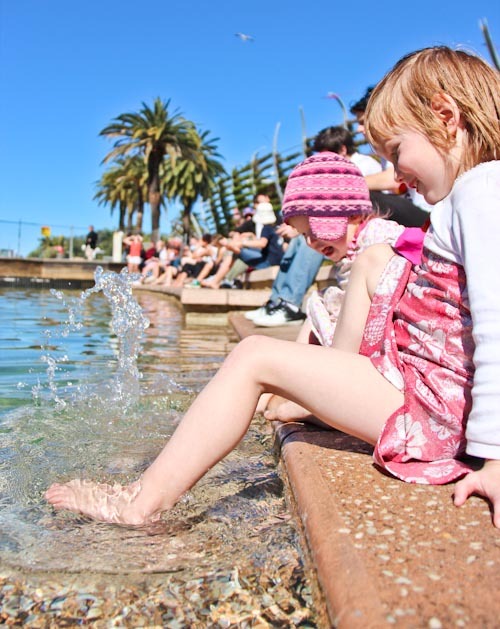 The girls test the temperature of the water at the Southbank pool. 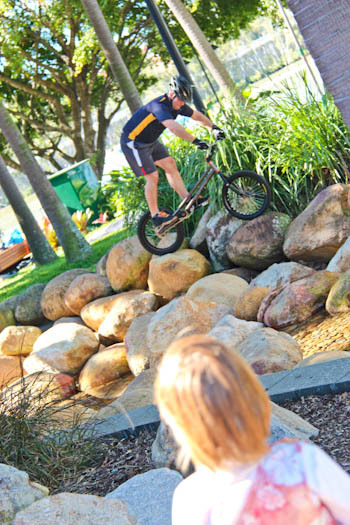 Away from the crowds, we stop to watch a bike rider hop rocks alongside a creek water feature. 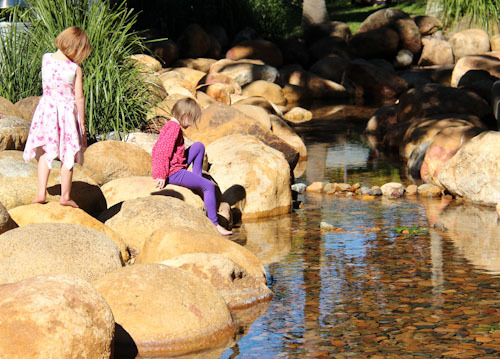 The cool water and smooth river rocks invite the girls to play. Despite it being the middle of winter, the day was pleasantly warm, and our girls quickly stripped off to enjoy the water. I managed to stay mostly dry while cheering from the sidelines. The girls love splashing in the shallow pools at the water-play park. 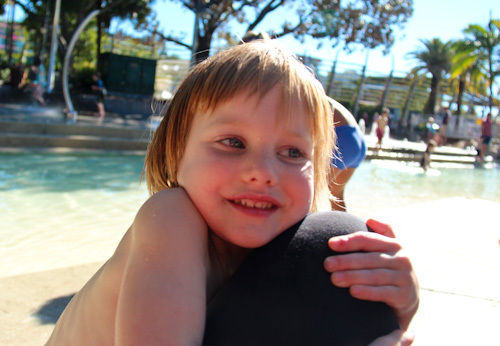 Calista hugs my knee — warm in its dark tights — to balance the coolness of the water. Aisha decides to follow Dell around the water features, keeping her company and making sure she doesn't fall over. It's lovely to be out and about with Johnny, making great memories as we share the wonders of our city with him! It was interesting being a small family again. 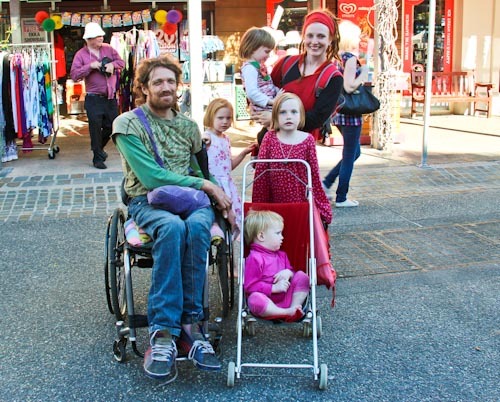 One woman commented to Johnny that he must be a proud father of five… When Johnny started protesting, the woman explained that she was joking about the doll Calista was carrying on her front in a sling (four girls + doll = five). Together, Johnny and I laughed at the greater joke, and we accepted the woman’s good humour with grace, not bothering to correct her. Being out with Johnny reminds me that there are so many opportunities on our doorstep for exciting outings. We’re blessed to be in a country that invests money into public, free recreational areas — they buoy my spirits as I watch the girls play so eagerly. I’ll be seeking out more chances for playing in the local area until we start roaming further afield, so if you know of any good places to go, please let me know! Johnny seems like a brother by another mother… glad that the girls have the opportunity to have a caring ‘uncle’ around for now. Oh, Southbank and the markets – what a wonderful place. A place of memories. Your so lucky to have nice weather to enjoy it, too. I’m stuck in cold Victoria :( lol. You are making me homesick for my hometown. ;) Having lived away from Brisbane for 4 and a half years now, it feels like forever since I have been to Southbank. It looked like a delightful day! There’s also a lovely beach at Shorncliffe, in Brisbane’s far north. The Beach is at lower Decker/Dekker Park. You have to look out for the driveway that takes you down to the beach. There’s a park at the bottom, and the beach is a lovely, sandy beach. There’s also a lagoon at Redcliffe, not unlike the lagoon at South Bank. Redcliffe is a beautiful place to visit, particularly on a Sunday when they have the market. You have GOT to take them to Moora Park in Shorncliffe. I think it is the loveliest park/playground in Brisbane. So much to do and see for little ones and right on the bay! I am glad to see that you are allowing yourself to start having fun again. Blessings and prayers going your way! I’m glad that Johnny is there to help you all enjoy companionship and exciting outings. It looks like he’s also getting quite the job as camera man!